I was disappointed that Yann Martel’s The High Mountains of Portugal was not named to the 2016 Booker longlist. There was so much to love in that novel, and I’ve continued to think about Martel’s use of backward-walking as a device to process the mutability of time, the surreality of grief. 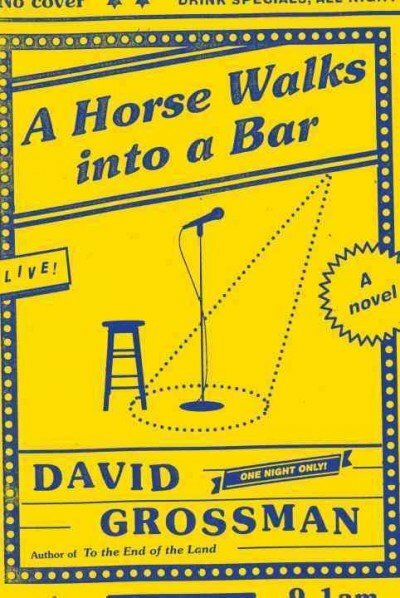 Associations with that book flooded back into my consciousness this week when I read A Horse Walks into a Bar, a novel shortlisted for the 2017 International prize. The Israeli author David Grossman is equally as adept as Martel in employing an alternative approach to standard human mobility as a device to cope with life. For both of these authors, there is a bedrock understanding that how a man walks reflects that man’s struggle to handle his emotions and control his life. Grossman’s central character Dovaleh learned as a child to walk on his hands. The device was was more than performance; it was a way to protect his young body against the physical assaults of older and larger boys, a defense against persecution. It’s hard to cuff a boy’s ears when he’s upside down. In fact, that surprising orientation left predators increasingly nonplussed, and it became a life strategy for the protagonist. To turn things upside down became the constant way to disarm others and to understand the injustice of life. When a sergeant comes to get the adolescent at compulsory training camp, but fails to clue him to the reason he has been summoned, he defaults to walking through the hot sand, the thorns of the desert, on his hands as he did as a child. He circles the sergeant in his confusion, madly trying to reduce the circumstance to something he can control. The image of turning things upside down punctuates his trip back to Jerusalem–the jokes of the driver, the offered cigarette, the violent rejection of his stomach to the nurture of the driver’s sister, even his own vomit beside the road. These become external images of the mental struggle to fight for his own orientation to equilibrium. Inwardly, the boy struggles to imagine death into life for first one and then the other parent. Not knowing which has died, he alone is imaginatively in control of destiny as the unlikely military truck hurls itself beyond its orders. The journey is as surreal as the monologue of the fifty-ish standup comic who remembers that pivotal night in time. This entry was posted in A Horse Walks Into a Bar, Booker 2017 International Prize on May 22, 2017 by Rosanne Osborne.